When the time has come to buy an air cleaner, you need to consider many different features in order to find the best air purifier for your room. Modern air purifiers come with a variety of filters, remote controls, digital panels, Wi-Fi operation, and more. Even if you choose all the right features and buy one of the most expensive models, it might turn out to be completely useless, if you don’t consider the coverage area. Some manufacturers sell several models for different room sizes while others offer a general model for an average room size. One of the main reasons for negative reviews I’ve found about the air purifiers online was that there is no effect. However, if the unit is equipped with a proper filtration system, there is no chance that it doesn’t filter the air. It must. The reason why you might not feel the difference is that you didn’t buy the right model for your room size. You might say that there is nothing complicated about determining the size. In fact, all the manufacturers put an “approximate” coverage area in the air purifier’s description. However, reading the numbers on the label is not that easy. Some manufacturers use a few tricks to make you believe that the unit can clean a bigger room than it actually can. 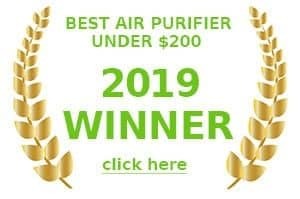 You are choosing an air purifier online or in the store and the label says that the unit can clean up to 1000 square feet. Sounds huge, doesn’t it? You probably don’t have a room that size in your house. When people see such a big number, they immediately decide that this air purifier will service the whole floor in their home or at least the basement. They bring it home, turn it on and get absolutely no results. Why? Because the number they read on the label didn’t refer to the area of the room, it referred to the surface area. What’s the difference? It’s simpler than you think. Let’s say you have a square room with the length of about 16 feet. Surface area of the room =16x16x6 – 1536 square feet. See the difference? So, in reality, such an air purifier can service a room with an area of less than 170 square feet. When you are choosing an air purifier, make sure you read the label carefully. Any number you see that has a “surface area” after it should make you wary. Most of the manufacturers will be honest about the size of the room the air purifier they sell can service. However, let’s not forget that the testing of these units was done in an ideal environment. Which means that they placed the air purifier in a clean room without too many dusty surfaces, no pets, no smoke, and other pollutants. Most likely, it was tested in a room where many other air purifiers were tested before it, so the air was more or less clean. The more people, pets, and furniture there is in the room, the worse the output of the air purifier will be. You must be ready for such a problem and not expect perfect results. In fact, you might want to consider buying a purifier for a room larger than you actually have. This way you’ll be sure that it will show the results the manufacturer promised on the label. Where to Install the Air Purifier? In order to get the best air purifying results, you need to place the air purifier smack in the middle of the room. This way it will have more chances to filter all the air fast. However, placing it in one end of the room won’t make the filtration results worse. It just might take longer to achieve the level of purity you are hoping for. Eventually, the air purifier will clean the whole room. I found that many people make a mistake of placing the air purifier in the corner or hiding it behind a couch. Some air purifiers allow such installation since the air intake is done from the top and the sides. However, many air purifiers you’ll find on the market have either intake or outflow done from the back. By placing such an air purifier against the wall, you’ll significantly reduce its capabilities. In fact, even if there is no air circulation done from the back of the unit, placing it tightly against the wall or the couch is not a good idea. Many units are powerful and get hot when working. By placing such an air purifier close to an obstacle, you’ll significantly reduce its lifespan. Ideally, you should place your air purifier in the middle of the room and on some elevated surface, such as a coffee table. If this is not a possibility, try to place it as close to the middle of your room as possible. Avoid walls, couches, and other obstacles. The right installation plays a significant role in the purification process. You mtight choose the perfect air purifier for your room size and end up being dissatisfied with the results due to the wrong installation. CADR x 1.55 = Square footage of your room. If you follow this formula, you’ll get the fastest air purification results for your room. Each unit has 3 CADR values: smoke, pollen, and dust. Most of the time, they are the same. If they are not, pick the smallest one for the most accurate results. 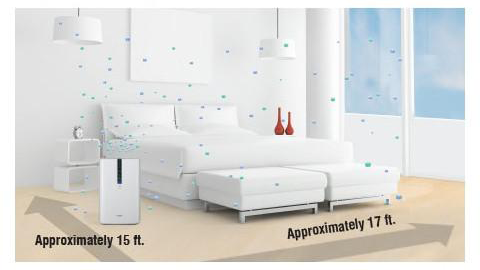 It doesn’t mean that an air purifier with a low CADR rating won’t clean a large room. It will just take longer for it to do it. ACH is another abbreviation I always pay attention to when choosing the air purifier. It stands for air changes per hour and shows you how many times the air in the room of the suggested size can be filtered in one hour. Buying an air purifier that has an ACH rating less than 2x is not a good idea. Most likely, you won’t be satisfied with the results. If you are an asthma sufferer, you might want to consider a 4x ACH rating for your air purifier. The above ratings are important for people who face such conditions as pollen or smoke air pollution. When it comes to an “ideal” room without too many outside factors, a big number of surfaces or inhabitants without respiratory conditions, choosing the right size of air purifier is much easier. All you have to do is follow the manufacturer’s recommendations. Noise is a huge factor when it comes to choosing the right air purifier. When you buy an air purifier with the manufacturer-recommended coverage area of 300 square feet and place it in the room just this size, it will need to run on at least the medium fan setting to do the proper job. However, many units have rather loud fans. You need to pay close attention to the noise level the air purifier makes. Most of the time, only the lowest fan setting is appropriate for a bedroom. Anything higher will wake you up during the night or make sleeping uncomfortable. If you want the air purifier to do a good job at the lowest fan setting, buy a unit, which has a recommended coverage area larger than the square footage of your room.